Balmer Lawrie Recruitment 2017-2018 Apply Online Application Form, 48 Junior Officer (Travel) Posts. 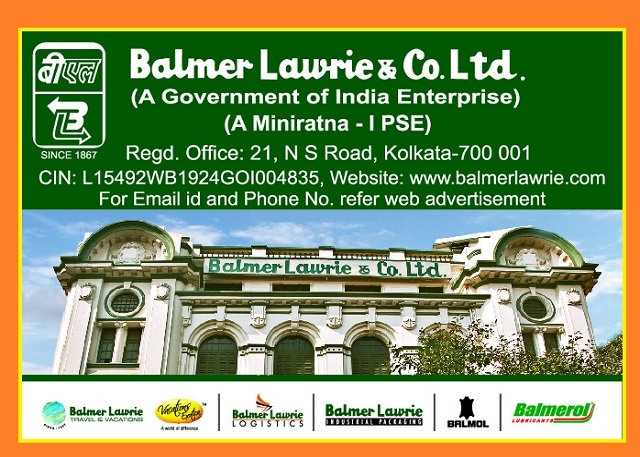 Balmer Lawrie Junior Officer (Travel) Jobs Candidates are requested to apply on-line through Official website www.balmerlawrie.com The last date for submission of Online applications is 12.12.2017. Balmer Lawrie Junior Officer Recruitment 2018 48 Posts. Syllabus, Balmer Lawrie Question Paper, Balmer Lawrie Admit Date Release Date, Balmer Lawrie Exam Date, Balmer Lawrie Result Date. Candidate complete Class XII[Pre-University]+Certificate Course/Diploma in Travel & Tourism Graduate + Certificate Course/Diploma in Travel & Tourism Graduate with Minimum 1 Year Experience in the relevant field.